Few things catch eyes from across the room quite like a sparkling piece of jewelry. But serious accessorizers know: not every piece fits for every situation. No matter how much it might shine, wearing the wrong necklace or bracelet during the wrong occasion can send a confusing message – especially when you’re mixing it up with different cultures around the globe. And with the majority of jewelry lines made by a single designer with one style in mind, the quest for that perfect expressive piece often leads to a dead end. It’s either search endlessly and spend big for multiple pieces that don’t suit you, or continue committing fashion fouls. Enter Nifty Sparkles: a beautiful new line of chic handmade French ethnic jewelry with a bohemian flair. Each piece is made by us and inspired by our worldly experiences – fashioned to represent you in any moment of your life. This balance is the main reason why the Nifty Sparkles line is so versatile. The pieces are colorful and vibrant enough to be suitable for any international occasion, yet delicate enough to not be overbearing or distasteful. No more sacrificing expression for a location-specific purpose. 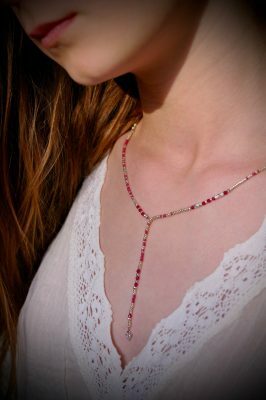 The Nomad tribal-inspired necklace made from tiny beads of red, turquoise, etc. In addition to these and many other womens’ items, Nifty Sparkles also offers a kids’ line of necklaces and bracelets. All products can be purchased conveniently over the company’s easy-to-use ecommerce platform. And no matter which items a shopper selects, they can be 100% sure that it was made from love. It’s this passion for artistic expression that drives them to create the best pieces possible. Nifty Sparkles is off to an impressive start in terms of sales, despite just opening for business earlier in 2018. Going forward, the company hopes to continue adding new products and lines and build off its early momentum by introducing new sales channels. If you’d like to check out their sparkling line of jewelry for your own self, please visit their online store at www.niftysparkles.com.